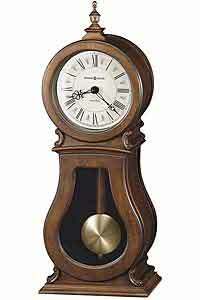 Howard Miller 635-162 Cleo Mantel Clock finished in Chestnut on select hardwoods and veneers. 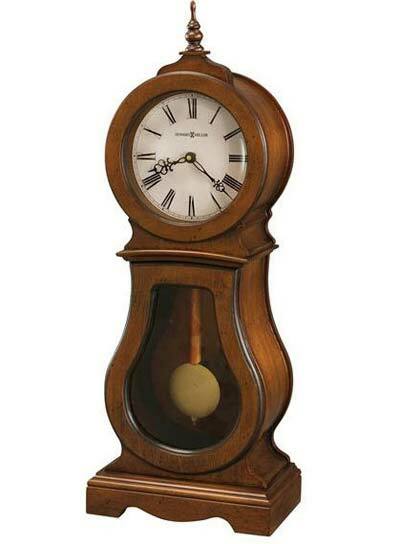 This traditional wooden mantel clock features a turned finial and seeded glass in the lower door. Aged dial with worn black roman numerals, wood bezel, black hour and minute hands and convex glass. The dial is off-white with Roman numerals and filigree hands. Antique brass-finished pendulum bob suspended on a wood stick pendulum. Quartz, triple-chime Harmonic movement plays Westminster, Ave Maria, or Bim-Bam chimes, with volume control and automatic nighttime chime shut-off option. Requires 2 C size batteries. 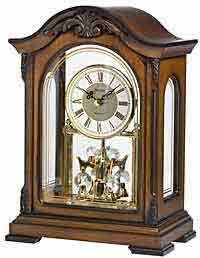 Clocks for sale at The Clock Depot including the 635-162 at discount prices.